Party Games at Showers... Should we or shouldn't we... That is the question! Here is my personal opinion on party games. I think it depends on who is invited. There are three different types of crowds, and I'll tell you my opinion with each. 1- ALL FRIENDS/ FAMILY: When you have a group of people who are all very close, and even this depends, sometimes all they want to do is get together and chat, catch up, and talk. In these types of situations, games can only get in the way, and are more of an inconvenience to the guests than entertainment. So, I would say- DO NOT do any games. But, if it is a group of friends or family that gets together regularly, then everyone might already be caught up, and need some other form of entertainment, so then I would say DO a game. 2- NOT MANY ASSOCIATIONS WITH EACH OTHER, JUST WITH THE PERSON OF HONOR: These types of groups can be a bunch of different sets of friends from different times in the person of honor's life, some from High School, some from College, some from work, a few neighbors, and a few family members. In this case, conversation is almost always at a loss. People feel awkward not knowing anyone, and there tend to be a lot of little groups and a few loners. In this situations I say DO a game. It helps for those loners to feel a part of something and to pick up the beat of the party and get everyone all involved in something together. 3- LITTLE BIT OF BOTH: This type of group might have a significant group of friends with a few loners here and there. Now, this is the hardest type of group to decide with. Those that just want to catch up, might be annoyed to have a game, and those loners will be relieved to have something to do before making up an excuse to leave. So, it is up to you DO one of NOT. Either way, once a game is started and if it's actually fun & interractive, people won't care. For our Chic Farm Baby Shower Party we decided to play a game since our situation was a #3 from above. And, the girls that were all friends saw each other often enough that we didn't feel they would have a lot of catching up to do. So, we found a game to do with animals (farm party) and babies (baby shower). 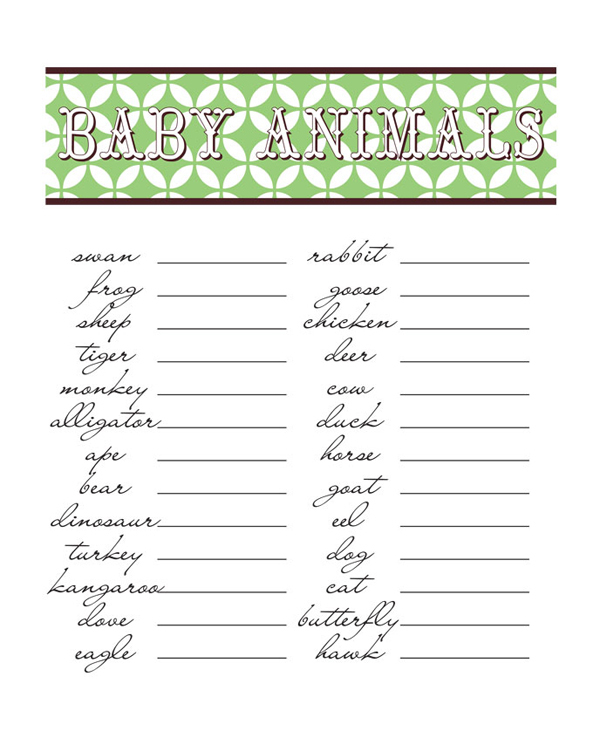 Each person gets their own paper and has to see how many of the actual baby name of the different animals they know... It's so much harder than it looks! 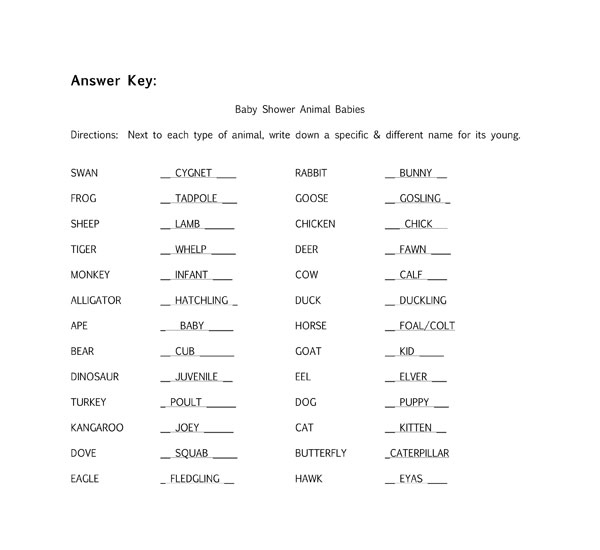 You can download the baby animal shower game sheet HERE. 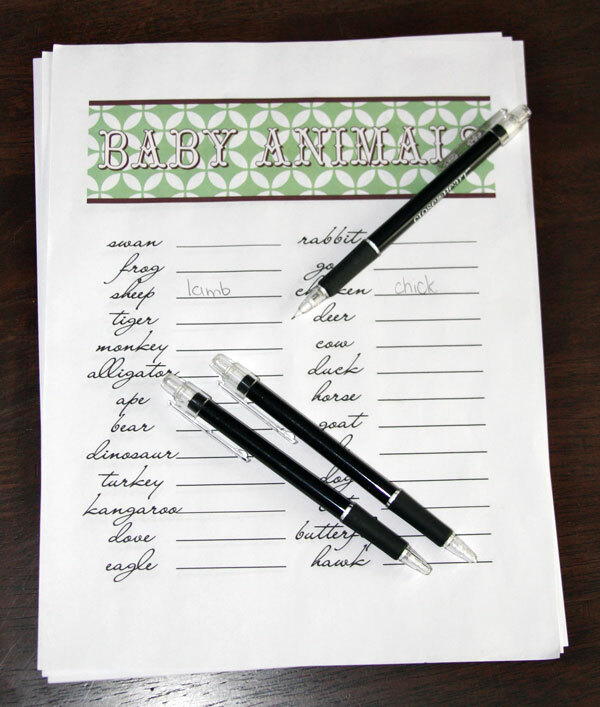 Then, you can print them and use them at your own Baby Shower! But, I think the best part of this game is going over the answers with everyone. I could not believe some people actually knew the answers to some of these! Useless knowledge really pays off! The girl who won this game got an astounding 19/26!! She deserved a prize, for sure! You can download the Answer Key HERE as well. I hope you are able to decide better whether or not to do any games at your next shower with a little help from me! Thanks for stopping by and check back soon, I just did a bright summery, Baby Giraffe Baby Shower and you won't want to miss these pics! Thank you for this fun game and so many great ideas! I'm sure everyone will have fun.